I am soooo looking forward to the new year. 2012 was one of those that had me screaming “DO OVER!” Still, I know I have a lot to be grateful for and of course December 31st is the perfect time to reflect on that: family, friends, my home, my cats (ok maybe it was hard not to put “cats” first.) But whether or not the year rocked or sucked, it’s always nice to have a clean slate. And a clean kitchen. So let’s start the year off right, with some black eyed peas! If you only make beans from scratch once a year, definitely make it New Year’s and definitely make them black-eyed peas. Of course, it’s said that these little legumes bring prosperity when eaten on the New Year, a little Southern custom that’s thought to have Jewish roots as well. But let’s leave the origin arguments to the discussion page on Wikipedia, and get down to what matters…the recipe! Traditional Hoppin’ John is made with ham hock, but in this vegan version we’ll be using “ham mock” or “sham hock,” or whatever vegan pun you prefer, it’s just a little liquid smoke and bay leaves. Since I’m not really content with a few beans over rice, let’s turn the bean around and prepare a full-on bowl. 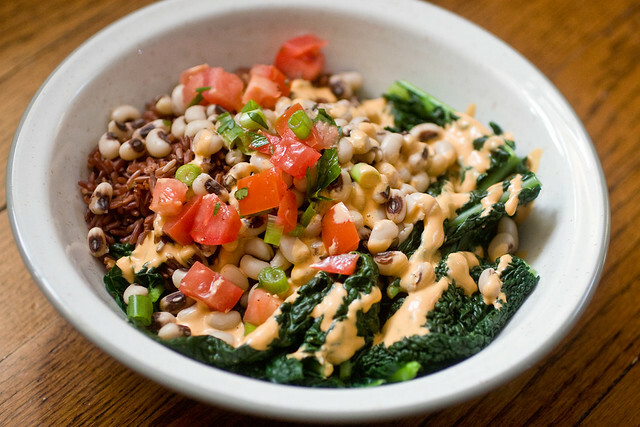 Lots and lots of steamed greens, red rice and smoky beans, smothered in a sauce that keeps up the Southern Jewish theme; a simple concoction of tahini and Frank’s Red Hot! This stuff is irresistible: spicy, nutty, savory, tangy, garlicky bliss. And to cool things down, a little tomato parsley salad is a welcome burst of freshness. This bowl will definitely start the year off right! From my kitchen to yours, HAPPY NEW YEAR ALL! Here is to a fabulously prosperous 2013, glowing with peace, love and plenty of tahini. ~For time management purposes, start the rice and simmer the beans at the same time. While those are working away, throw together the sauce and salad. Steam the greens once everything is ready, since they take a matter of minutes and you don’t want to serve cold greens accidentally. ~If you prefer not to make the beans from scratch (for shame), you can use two 15 oz cans of beans, rinsed and drained. Heat very gently on the stove top or in the microwave, and sprinkle with a little salt and a few drops of liquid smoke. ~Tahini can vary in liquid from brand to brand. Some are very fluid and others are stiff and chunky. I prefer to use the more liquidy brands. Don’t be surprised if you have to add up to 1/2 cup of extra liquid when making the sauce, depending on the kind of tahini you have. ~Collards are probably the most fitting green to serve here, but the ones at my local Whole Foods were looking kind of sad, so I went with beautiful lacinto kale. Collards take about 7 to 10 minutes to steam, and kale only about 5. Simply discard the rough stems, tear leaves into large pieces, place in your steamer, and flip every few minutes using tongs, while checking for doneness. I like a little snap left in my greens, and consider them done when they’re a bright Godzilla green. ~You can definitely make everything but the greens and tomatoes in advance, if you like! The beans taste even better if they have time to absorb the smoke and seasoning overnight and the sauce keeps well in the fridge in a tightly sealed container. Drain the soaked beans, and place them in a 4 quart pot. Submerge in water, with water coming about 2 inches above the beans. Add bay leaves, salt and liquid smoke. Cover and bring to a boil. Once boiling, bring the heat down low, and let simmer for about 20 minutes. Check often so that they don’t overcook. When beans are still firm, turn the heat off and uncover. Let them hang out until everything else is ready. They will continue to cook in the hot water, so turning the heat off ensures that they don’t overcook. Simply blend everything up in a little blender until smooth. A Magic Bullet works perfectly. Add water by the tablespoon to thin as needed. Taste for salt and spiciness. Toss all ingredients together in a medium mixing bowl. Taste for pepper and vinegar. Place greens and rice side by side in a large bowl. Top with black-eyed peas. Drizzle with sauce and top with the tomato salad. Serve immediately and prosper! Oh man. I want that RIGHT. NOW. Please tell me what brands are more liquidy?! I’ve only used one brand and it is chunky. I thought they were all that way. It drive me crazy to try to mix it up!! Oh, this looks perfect! It will be made soon for sure. Never would have thought of tahini and Frank’s –that’s a seriously cool combo. Yeah, after years of pouring Frank’s on after the tahini I finally decided to take the plunge and combine them legitimately. You won’t be disappointed! I’ve been so obsessed with tahini lately, and I love that it’s spicy! The tomato parsley salad sounds so refreshing, too. Looks like a great new year’s dish! I love black eyed peas! This looks like a great New Year’s recipe, thanks so much for sharing. I’ve been a vegan for a little over a year and I must thank over and over again. My daughter, a vegetarian for years, gave me several of your books, and you taught my to really enjoy eating this way. And your cookies saved me many times over! What you do really makes a difference. Thank you, thank you, thank you! I wish you the happiest and most blessed of New Years! I grew up with Black Eyed Peas and Ham on New Year’s Day (my grandparents were from Louisiana), and the last few years I’ve really missed the simplicity and good wishes of this kind of traditional celebratory meal. Thank you SO much for publishing this– I think I know what I’ll be eating tomorrow. I hate to say I HATE any food ingredient, because it seems so narrow and limiting. But seriously, i loathe parsley. Like even the tiniest bit. Do you think it’d be weird if i replaced with cilantro? I mean, I’ll eat anything with cilantro on it. Of course not, cilantro would be great! As I picked up a pack of black-eyed peas in the kitchen this morning, I also wondered how to make them interesting for the New Year’s repast. Everything about this recipe is right–big thanks! Bonne année et bonne santé! Can’t wait to make your version. I have my own vegan version but this is more dressed up and interesting and I like it! My family does pork and sauerkraut on January 1, so I’m taking homemade seitan but this here recipe of yours is officially on deck after that! Thanks, Isa! Happy New Year. Oh Hot Dang! I am totally making this for our New Year’s Dinner! As always, Isa, it looks amazing and inspired. Thank you for the HUGE contribution you make to the vegan world. Happy New Year! Happy New Year to you too, Isa. You make my life better. Thank you! Franks’s + Tahini = Genius. Happy New Year! Already made the beans and have been picking at them all afternoon…yum! Can’t wait for the entire combo tomorrow. The tahini/hot sauce combo sounds ridiculous! Wow those are some very kind words! Thank you and Happy New Year, to you! Just made the beans and can’t stop eating the red hot tahini sauce- who would know but Isa that it would be such a great combo! Isa thank you for all your great recipes. We have always thought about making black eyed peas and greens on New Year’s Eve but I wasn’t sure if I liked black eyed peas. Saw this recipe this morning and my husband and I decided to try it. I’m not usually one to comment but I had to tell you how much we LOVED it. Honestly delicious. Thanks! Was a great (and NEW) idea for the traditional black eyes this Hogmanay. I made what I could tonight to minimize cooking for tomorrow. And I cannot stop eating the red hot tahini sauce by the spoonful. I’m going to have to make more and lock it up somewhere. Absolutely delish!!! My sister and I made it this afternoon with some minor adjustments for what we had in the kitchen and… oh my god. Incredible. Isa never lets us down! Thank you, thank you, thank you! This was just what I wanted to cook, and since it’s your recipe, I know that it will be wonderful. Had this for dinner last night and lunch today! Didn’t feel like waiting for rice to cook for the lunch version, so served the other ingredients over leftover mashed potatoes. Delicious. Sounds like a delicious compromise. Footnote: I used collard greens, and a little cilantro along with the parsley, in the tomato salad. With the chili sauce-enriched tahini sauce, a gorgeous meal was had by all! Thanks again. The sauce is fabulous! Everybody [9 years to 82] loved it. Thank you and Happy New Year Isa! was planning on some type of black eyed peas/greens concoction for NYD and was so happy to see this. I thought it it was delicious, got a lot of compliments on it and it went fast. i think i may have to make it again this week. emmmm….had to use canned black eyed peas (oh the shame….but the grocery store was out of dried–was all of boston preparing to make this dish?? i think yes!) but still so,so yummy. is it just me or do other people feel like they need some extra luck and cash in 2013? thanks, isa and happy new year to all the PPKers! It was wonderful! I made this today instead of our traditional mix. THANK YOU!! The mix of flavors is so complicated, but each is still discernible. Bravo! Wow – this is the BEST Hoppin John I’ve ever made. You really hit it out of the ballpark with this one! Thank you! You are my new hero! I’m new to veganism, making a slow transition from 2+ yrs of being a semi-vegetarian, and it is recipes like this that really get me excited about being a vegan. The flavours are electrifying! My notes: used bok choy for steamed greens (YUM! ), cilantro instead of parsley (my Texan taste-buds took over! ), and brown rice – my fear of ending up with yet another pot of mushy rice led me to this http://www.skinnytaste.com/2012/04/how-to-make-perfect-brown-rice-every.html and the results were FANTASTIC. HAPPY NEW YEAR and thank you SO much! Awesome, sounds like you learned a lot for this recipe! OUT OF THIS WORLD. Thank you~! that Hot Tahini is outta this world! Yeah, I have some leftover that I’m basically treating like liquid gold, which is so silly since it’s easy enough to make another batch. What a yummy start to the new year. Thank you! Even my notoriously picky son loved this. The sauce is killer. I made this on new years for a friend who was visting from America and he and I really liked it! Sadly we don’t have frank’s red hot in Sweden so I subbed with taco sauce. I don’t know how Frank’s supposed to taste but it turned out good! Tried this with Tofutti soy sour cream instead of tahini since my daughter is allergic to sesame. It was still quite delicious. I made a version of this tonight, just dumped the greens in with tomatoes, liquid smoke, and black eyed peas, then made the sauce to drizzle on top. I went with mustard greens. So delicious! We just omitted the rice and made it more of a stew. WOW just made this and it. was. amazing. 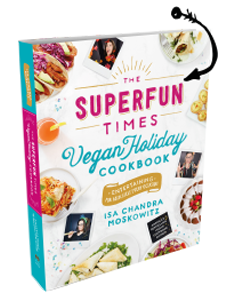 thank you so much for making such delicious vegan food – I love that I can make your recipes for everyone (including my meat-loving hubby) and they love them. You have the best tastebuds ever! Happy New Year! This was delicious! 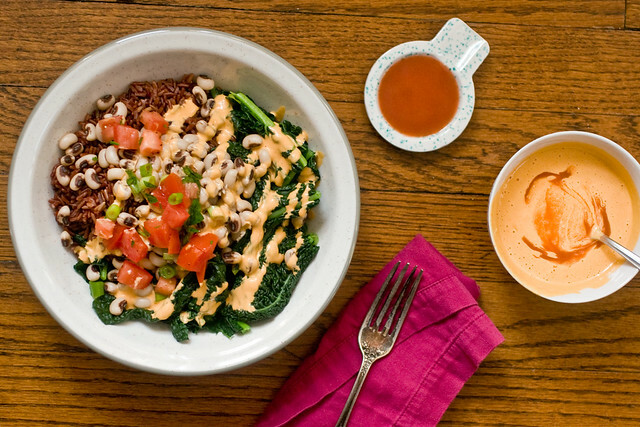 I’ve been making Hoppin’ John annually for New Years, and the Red Hot Tahini sauce really took the dish to a new level. Used a Vitamix blender and ended up adding double the recommended amount of water to make the sauce a little drippy. Thanks for sharing, Isa! happy new year to you too! (umm, I thought it was taken for granted that cats come first…) Thanks for all you do, you make the world shine a little brighter. Hope 2013 is a fab year for you! hugs! You are sweet, thank you! I’ve never before used liquid smoke nor Frank’s Red Hot. I licked the bowl. The end. I made this with the collard greens from AFR and skipped the tomato parsley salad. My guest from Japan loved his first traditional American NYD meal. I loved the tahini dressing and want to try it on a taco salad next!! This was Deeeeeeeeeeeeeelicious! Thank you, and happy new year! I’ve already commented but I’m commenting again. I want to put this red hot tahini on EVERYTHING. Mushrooms. Veggie burgers. Roasted veggies. It is delicious. Oh Isa- I LOVE you and your recipes for BOWLS 🙂 Can you make a recipe types tab on the website for bowls?? I would eat them all week long. They are the perfect lunch! That Red Hot Tahini sauce over a bowl of pasta and veggies. Oooooooh yeah baby! As many have highlighted in the comments: This sauce, so simple (tahini + lots of hot sauce = you want to put this sauce on many–if not most– things you eat; many of us are thinking of ways to use this sauce on a regular basis), was there all the time, right under our noses, but we didn’t see it. It required your special, creative culinary imagination to come up with. You have the gift. One of my favorite things about this recipe, besides being yummy and super easy, was the thought of vegans around the globe enjoying this same meal on the same day. I would have imagined us all dining around my table, but my house is really small. My new favorite dish. This awesome. And it looks just like the picture! New Year’s resolution: put hot tahini sauce on everything. Haha, finally a resolution I can stick to! I made this tonight and the red hot tahini sauce is amazing! Just made this. Totally awesome sauce, and clever bean infusion. I think this is going to be a standard dish in our house from now on. Great work! Thank you! Oooooh boy was this ever tasty! This (especially the divine SAUCE!) will be added to my regular recipe rotation for sure. – I was craving EVEN MORE veggies, so I added chopped savoy cabbage, spinach and avocado to the salad. I was a few days late, and I used canned beans since they were in my pantry, but this was a mighty good meal. One of my favorites of the new year so far. The sauce was amazing, and all of the components just worked so well together. Thanks for the wonderful recipe! This was lovely and fresh and well-balanced-seeming for the new year. I missed out the nutritional yeast and added lemon juice to the sauce, which made it really sunshiney. If it were socially acceptable I’d eat the Red Hot Tahini sauce out of a bowl until I was sick. Also for people wondering about a more liquid tahini I’ve been using http://www.amazon.com/Al-Wadi-Tahina-Ground-16-Ounce/dp/B001E5E2CW/ref=sr_1_8?ie=UTF8&qid=1357536106&sr=8-8&keywords=tahini and I love it. with tofu and tempeh and pasta and pie. we’ll try all the things that a vegan can try! by using ingredients straight from the earth. none of that equals what Isa is worth! *Ten from the can. From scratch is way way better than canned. Excellent recipe, as always Isa. It is just what the doctored ordered after a holiday of eating out and over indulging in junk food. I made this last night, it was tasty and hearty. I think I am going to make more of the sauce for other noms in the future too! It was even better than I expected. I was feeling a little over-indulged after the holidays and this made me feel much better. I was just wondering, I can’t find Franks sauce (I’m in England) so I used tabasco, is that a good sub? This bowl looks amazing. Also, I’m glad to learn I’m not the only one who likes mixing Frank’s with tahini… friends have given me weird looks when I suggested such in the past, but they don’t understand the magic. If I could drink Frank’s + tahini straight-up without getting sick I probably would. A little late but happy new year and THANK YOU. This was delicious, I love both hot sauce and tahini but never combined them. I had some butternut squash sitting around so I cut it into little cubes, roasted it and threw it in on top… the sweetness was a nice complement to the bitter greens, tangy-rich sauce and smoky beans. Cannot stop emailing this to people. AND special bonus — the rare recipe that actually looks JUST LIKE the picture. bravo! I made this today, the lazy way (heck, I didn’t even have hot sauce, so I used salsa) and it was good. Really GOOD. Suffice to say, I can’t wait to make it with black eyed peas and actual hot sauce. Looks yummy! But as a resident of the south, I must point out Hoppin John traditionally has beans and rice. Which would be a nice addition to this wonderful bowl. Hmm. Not sure what you mean because the bowl has both beans and rice. Absolutely beautiful! And yummy I’m sure!!! This was absolutely delicious!!! Thank you! Because of this Red Hot Tahini sauce, I’ve had to learn to make my own tahini. I could not justify the expense of over $13 for 16oz jar of organic no salt added tahini, but for just over $3/lb for organic raw sesame seeds, yup, most definitely! Soak the seeds for a few hours (to remove bitterness and enzyme inhibitors), drain and rinse, put in 300F oven til dry and just turning light brown. Put in a food processor until it’s tahini! I’m glad I ignored all of those tahini recipes I found online that said to add oil, for none is needed whatsoever. Just process until very smooth. I’m so excited to make this tonight! Would I be crazy to substitute sriracha for all the hot sauce? Because sriracha is all I have on hand! Sriracha is much spicier, so you may want to use less. But I am sure it’ll be good because…Sriracha! The Red Hot Tahini is somehow as satisfying to my tongue as a zesty cheese sauce. This will definitely help me to stay on a healthier diet! Thank you. I have never had Hoppin’ John before, so I am not sure what it is supposed to taste like, but overall I found the dish very satisfying. I don’t like raw onion, so I used finely chopped celery instead of the green onion, and it actually worked out pretty well, I think. I wasn’t sure how to eat it, so I mixed the whole thing up. Is that okay, or did I do it wrong? Made this tonight for dinner and even my 2 year old loved it!!! But she is addicted to Frank’s Red Hot so this was gonna go over well anyway 😉 I did everything exactly to the recipe except for the rice. I ran out of red rice so I used long grain brown but it was still good, maybe not as colorful 😉 But seriously, Isa…You can make a killing if you sold this sauce!!! Wow. I made this tonight and it is so much more than the sum of its (awesome) parts. It was delicious and warming and filling, and best of all I feel great an hour after eating it, not full in a heavy gross way. Next time I’m going to double the sauce, because it is incredible. I just made this and it is soooooo good!!! The sauce is amazing! I made this after our New Years karate training Kagami Biraki. I had friends over so I served it like a feijoada. It turned out great! I used swiss chard and black rice. Thank you for all the inspiration, Isa!! This was awesome! The red-hot tahini is hotter than I usually go but really flavorful. I made it with cherry tomatoes which worked well. Thank you for sharing!! Your food looks amazing!! I can just taste it every time I see it! I have to add to the praises being sung, here. I’ve loved the bowl concept ever since I got my pre-ordered copy of *Appetite for Reduction. * This bowl is groovy and yummy and all things good and New Beginningy. But that Red Hot Tahini is a priceless artifact. I am eating it on everything (roasted butternut squash last night) and I cannot believe I never thought to combine it as Isa did. Thank you so much!!!!!!! I made this tonight and I have to say WOW! This was an absolute flavor explosion. I made this exactly as per the recipe and it does not need a thing!! I look forward to the next recipe I am going to make. This website as made our choice of changing to a plant based diet such a wonderful decision. I have not craved meat at all and recipes like this help us keep the passion for food alive. Awesome! When I saw this I knew I had to make it and it did not disappoint! Awesome recipe as usual! Another winner! Your recipes are very inspiring, thank you! An amazingly simple concept enlivened by tahini. Genius. You make me think I can cook, but what I’m good at is following directions. And one more thing, Isa, there is just something weird going I here. I’ve been cooking my way through your books and blog for the past 9 months, and then randomly watched forks over knives last night, started obsessing about how much oil I cook with, thought about how much investment there is in oil in my cupboard (it’s like Texas in there), went on amazon to look at their cookbook, and who, but who, is one of the contributors? Duh. Of course. if I omit parsley, nooch and liquid smoke will it be okay? not fan of all three. I was so unsure about the tahini-hot sauce mix before I made this. But oh my gosh, it is soooooo good! Love this dish. We just made this, except I subbed garlic skates for the green onions (because everything could use more garlic). So yummy and it made a ton! How do I substitute canned beans if I am in a hurry? Do I just cook them up a bit with liquid smoke??? Amazing! I sautéed my kale with garlic until it was crispy (cuz I like it that way!) But that sauce is a killer. I don’t have a lot of creativity as a cook. Anybody have a suggestion on how else to use it? As a “mayo” for fries? I made this tonight and it was awesome! It’s the best dish I have ever made! I can’t wait to make it for the next potluck I go to. I heated tortilla chips in the over for a few minutes then took them out of the oven and pour the warm sauce over top then sprinkled green onions and chopped tomatoes on top. You can also spread it on a vegan grilled cheese or on top of a veggie burger. This may be the best thing I have ever eaten, …period. This was amazing!! The sauce will become an addiction. I didn’t have access to liquid smoke, so I cooked the beans with a scoop of smoked hot paprika and it did the trick! Thanks for the great recipe! Just bought everything and ready to make for Jan 1 2014! Bring it!! I bought Isa Does It for my hubby for Christmas and I have never seen a finer cookbook. We have Appetite for Reduction and I already knew I loved your writing style and recipes but this one is the BEST! It’s beautiful and I love all the photos (nice thick paper) and many categories. My two youngens especially love the sunflower Mac and the dessert section. Thanks again! Made this last year and was happy to pull it up again. It’s what’s for dinner tonight! This is absolutely wonderful and the sauce is amazing! Thank you! Made this for the second time today – delish! The only change we made was to swap out white wine vinegar for red. The first time, we made it as written and thought the red wine vinegar was a little strong. White wine vinegar was perfect for our tastes. Thanks so much for a recipe we all enjoyed to bring in 2014! Absolutely delicious. I think I could drink that tahini sauce. Omfg. I didn’t make the whole meal, but I was looking for a way to mix-up ALL these early summer greens I’ve been finding myself with, and the Red Hot Tahini sauce was just the thing. YUM! And so easy, too. I’ll make the whole thing one day, but til then, I’ll be thinking of all kinds of other places to use this delicious sauce. You’re awesome. the best I’ve found out till now. But, what about the bottom line? Holiday meals, how to beat the hell out of stress. | ChaCha AlaMode's babblings. This is the second year I will be making this for New Year’s Day. I loved this recipe! I wish I had friends to share it with this year, but we moved. Maybe the next time! I made a great dip using your red hot tahini recipe…. I just wanted to say that we are newer vegans, only have been for about 5 months. We found this recipe before New Years and have made it 4 times since then. It is absolutely delicious. I double the sauce because it’s so good. I practically bathe in it. Just had this for our New Year’s dinner, and it was fantastic. The onions sautéed in sesame oil really took the beans over the top. That is a technique I will employ again. Also I just mixed some spinach right into my beans and served it over rice and/or sweet potato chips. That sauce is the bomb. Muy yummy. Thanks for a great beginning to 2017. Thank you for posting this recipe i was searching for a long time to find something like that!